Suffolk Masonic District - Long Island, NY: What do Younger Masons Really Want? I have been a Master Mason for just three short years. I turned 40 this year, and by all demographics, can still be considered a younger Freemason. No one seemed to have ever asked any younger Masons if easier Freemasonry is what they really want! During the time I have have been a Freemason I have been told by many older experienced Freemasons that we have to make it easier for young guys to join. I've been told that the decline in membership is partially due to it being to hard for young men to find time from family and work to Freemasons. So, we have to make it easier. So, it the pursuit of making it easier we have offered One Day Classes. We have loosened the rules on proficiency in the first lecture. We've kept our dues low to accommodate men who may not have the funds to pay higher dues. In many lodges we have been less rigorous in our examination of new candidates by investigating committees. You seldom hear about a black cubed being dropped because, after all, don't we need the members? But, there has been one basic problem with all that I have been told by long experienced Masons about what younger men want. None of them seemed to have ever asked any younger Masons if easier Freemasonry is what they really want! 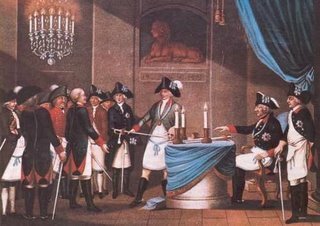 And, in fact, I have come to believe that easier Freemasonry is not what younger men who want to join our fraternity are wanting at all! My own experience is echoed in the stories I hear from Masons under forty. Younger Masons do not want Freemasonry handed to them. They want to earn it! I became a Freemason in great part because of the witness of my Grandfather to the value of Freemasonry. When he died I attended his Masonic service and was impressed by the men in dark suit, white gloves, and white aprons who paid tribute to my Grandfather. At that funeral, I promised myself that some day I would be a Mason if such a fraternity of honorable men would have me. More than a decade passed before I acted on that promise. during that time I read every web page, book, and article I could find on Freemasonry. I read about the history, philosophy, and ethics of the Craft. When I petitioned Phoenix Lodge, I was informed that I could receive my degrees in a One Day Class. But, I thought about my Grandfather and requested that I received my degrees in the usual way. I wanted to experience the full initiatory experience my Father, Grand Father, and Great-Grandfather had experienced. I wanted to memorize every word of the ciphers given to me. I did not want my mentor to cut me any slack. We want the freemasonry of our Fathers and Grandfathers. We want to be challenged, stretched, educated, and trained. We want the opportunity to take our rough ashlars and begin to smooth them. As I have seen young men come into the Craft I have seen that they want many of the the same things I wanted. Young Masons do not want anyone to make it easy for them. Younger Masons that I have talked to believe that we need to make it harder and not easier to receive the degrees. Younger Masons want to read and learn about the philosophy and teaching of Craft Masonry. They do not want Freemasonry handed to them. They want to earn it! In my own professional life I have made a study of young adults. While my study involved young adults in a church setting, I had opportunity to write some course material for use by churches for young adult ministries. Much of what I learned about young adults applies to Freemasonry as much as it does church. Young people are searching in our society. They are searching for meaning, depth, and focus to their lives. They are searching for a philosophy and ethic that will help them to live a better life. They are searching for growth and self-improvement. In short, they are searching for what Ancient Craft Freemasonry in its purest form offers them. If older Masons really ask young Masons what we really want, I believe you will find that we want the fundamentals of the ancient and honorable Craft of Freemasons. We want the freemasonry of Anderson's constitutions. We want the freemasonry of our Fathers and Grand-fathers. We want to be challenged, stretched, educated, and trained. We want the opportunity to take our rough ashlars and begin to smooth them. We want to be Freemasons in the fullest sense of the word!